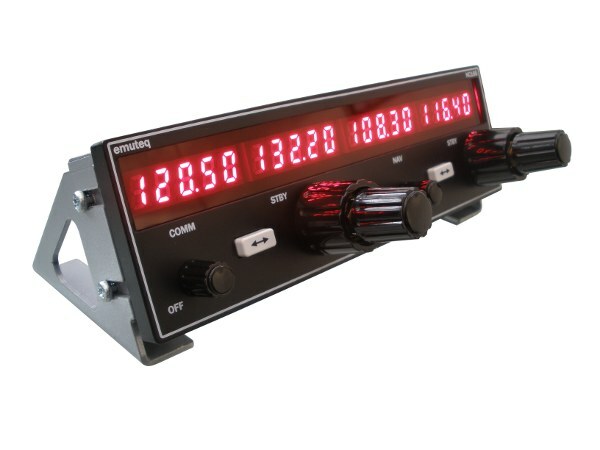 The emuteq NC165 is closely based on the real world Bendix King GNS Aviation Nav/Com Tuning unit. Designed to work in conjunction with Flight Simulator 2004 and FSX from Microsoft, our hardware interface eliminate the need for the mouse when tuning frequencies in flight. Is the NC165 compatible with FS2004, FSX and X-plane? The hardware is compatible with the FS2004 and FSX only. Is the NC165 compatible with all versions of Windows and Mac? The unit has been tested on Windows XP, Vista and Windows 7 and is true plug and play. Once connected via USB, the unit is recognised as by the PC. A small software app runs in the background to configure the unit to operate as NavCom 1 or 2. I already have the emuteq GNS 530 hardware, will the NC165 hardware still work along side this? Yes, the unit can work with 530 hardware and can be configured to run as NavCom 2 for example. Do I need an adaptor to power the Unit? No, the unit is powered by USB power so no additional power supply is required. Yes, the included desk stand brackets are removable, there are captivated M3 Nuts in either side of the case to aid in panel mounting. Recommended panel cut-out dimensions are 157mm x 48.5mm with max 3mm corner radius. Do you hold the NC165 in stock? All shipping is with the big name companies. We use UPS as standard so shipping normally takes a week or so. Can I adjust the LED Brightness? Yes, the LED brightness is fully scaleable to suit your personal taste. The user guide is a simple to follow guide to get you set-up quickly and easily and explains the integrated functionality of the Unit..